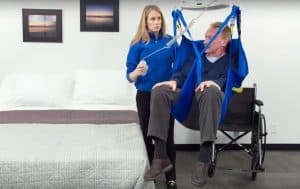 Ensuring a safe and comfortable transfer experience for both patients and their caregivers is made possible through the installment of ceiling lifts provided by us at Orthopedic Service Company, alongside manufacturer Handicare (formerly Prism Medical) . The process of selling and installing ceiling lifts in Durham, NC starts with guiding hundreds of care facilities and home caregivers through the process of implementing safe handling techniques. Why choose a ceiling lift? Orthopedic Service Company works along with Handicare (formerly Prism Medical) to offer their clients in Durham, North Carolina ceiling lifts of the highest of qualities, giving access to a complete line of portable, fixed, free standing and bariatric ceiling lifts. Through Handicare (formerly Prism Medical), you can rely that each lift has been built with the caregiver in mind, meaning our ceiling lift systems require only the minimal effort to be operated. As part of our services, we will answer all of your doubts regarding the equipment, handle its installation and take the time to ensure caregivers completely understand how to use it in a comfortable and safe manner, both for them and the patients at their charge. Contact us today to find out more about the purchase and installment of ceiling lifts in Durham, NC.